The island of Borneo, which is split between the countries of Malaysia, Indonesia, and Brunei, was once covered with a lush tropical rainforest, but in the wake of ongoing deforestation and the expansion of plantation farming, the habitats of the island’s endemic and endangered species are being destroyed rapidly. Relentless deforestation has precipitated the loss of 90% of the orangutan population in just 100 years. At this rate, some expect this species to become extinct within the next 20 years. 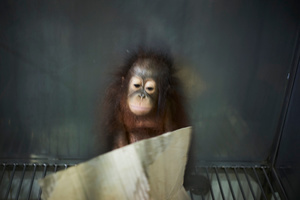 When the orangutan baby came under the protection of the Sepilok Orangutan Rehabilitation Center, it was already motherless. Perhaps it had strayed, or perhaps its mother was killed by humans. In either case, it has almost no chance of ever seeing its mother again. The number of orphans will probably continue to rise, as the clash between civilization and the wild continues.